Great Britain's Liam Phillips completed the elite men's double at the season's first BMX World Cup series event on Saturday, adding the Supercross title to his time-trial success. The 25-year-old, who was crowned world champion in New Zealand last year, finished ahead of Australia's Anthony Dean and Tory Nyhaug of Canada in Manchester. "Everywhere I looked this week I was on brochures for the event and I found it difficult to manage that expectation," Phillips told BBC Sport. "So to get on the start gate and produce what was required feels amazing." Phillips's finish time of 28.468 seconds, racing with seven other riders, was 0.474 seconds faster than his winning individual time-trial time on Friday. Fellow Briton Kyle Evans also reached the elite men's final, crossing the line in fifth place, while Charlotte Green made her first women's elite final, finishing just outside the medals in fourth. Caroline Buchanan of Australia topped the women's podium, with Brooke Crain of the USA in second and Venezuela's Stefany Hernandez third. Green, 20, has only been training in the British Cycling Academy programme for the last six months. She said: "I didn't expect that result at all. I believed in myself and that's what got me to that result so I'm really, really pleased." Phillips said the showing by Evans and Green showed British BMX was in rude health. "These guys are 20 years old and they're up there with the best in the world and being able to deliver. 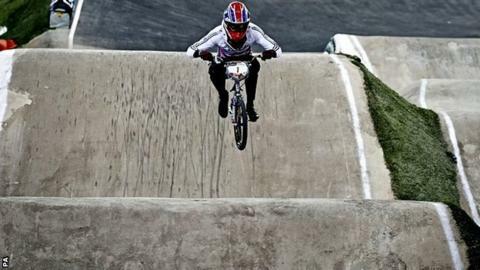 "BMX in the UK is very strong and it's only going to continue to get stronger." Having made a winning start to his season, Phillips is aiming high for the rest of the campaign, which could involve both retaining his world champion status as well as topping the World Cup standings. "I love setting myself big challenges. I don't think it's unattainable - I was close to doing it last year. "The top of the agenda is to retain the world title. It's going to be very difficult as no-one's managed to do that certainly for the last 10 years. "It's something that excites me, gets me out of bed every day and makes me work hard to be able to try to do that. "And the World Cup overall is about being consistent so if you string a few good races together you'll be thereabouts come the final race in America." That fifth and final World Cup event takes place at the end of September, while Phillips will try to defend his world title in the Netherlands in late July.